Hey Guys! October has been a whirlwind and November is already here! Hope you all enjoyed the Halloween weekend and no doubt some of you will have gone absolutely crazy with some of your costume outfits this year! As you may know, I have been digging out all sorts of items out of my closet recently and I found yet another hat, so I was determined to incorporate this into an outfit post. The monochrome look has pretty much been my forte recently; I have realised that my wardrobe only consists of black, white, blue and grey clothing..and I am NOT ashamed! A button down has always been a favourite of mine, as a crisp white shirt can create a sense of smartness to an outfit. To give this outfit some contrast, I decided to leave the shirt untucked and have the sleeves rolled up to achieve an overall smart-casual look. 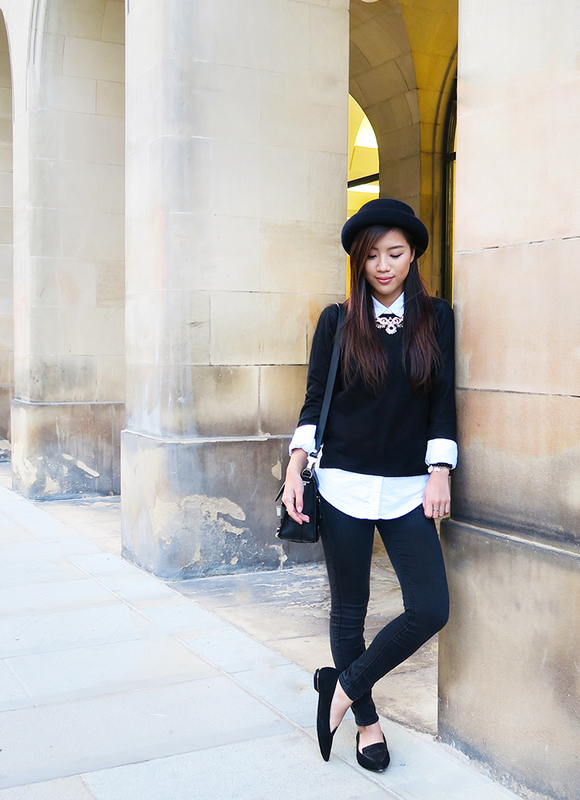 And of course, it wouldn’t be me if I didn’t add any statement jewellery to amp up this outfit. Pointed flats have also been on my radar during these past couple on months. I love the sophistication it can bring to an ensemble; it’s a great item to have especially for those who want to look a little smarter without having the pain of wearing heels on a daily basis! I hope you guys enjoyed this new blog post! Writing these blog posts has allowed me to become more adventurous with my outfits..even though they don’t have much colour to them! And I appreciate every one of my readers, you guys have inspired me to create more and new different looks every week. If you guys want to keep up to date with me and see what I get up to, follow me on Instagram and lets stay connected! WOW !!! Really love this look ! 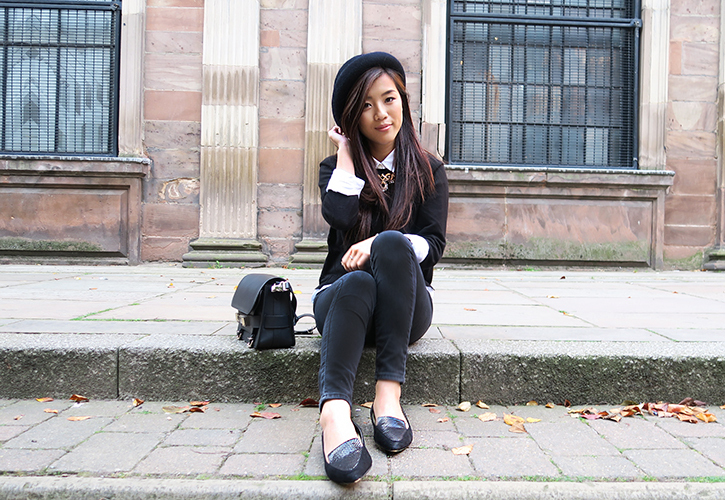 This outfit is so cute and I just love your bowler hat!! !